KENZO WORLD is a playful and dynamic fragrance… true to the KENZO spirit. It’s a bold, spontaneous, surprising & a free-spirited fragrance that celebrates the freedom of thought, diversity and self-expression. It opens with a floral bouquet of Peony & Jasmin; the heart consists of red berries with a dry down of Ambroxan. The eye shaped bottle is most certainly eye-catching and takes inspiration from many aspects of the KENZO fashion and jewellery collections. The gommato cap is inspired by the iconic KENZO Kalifornia bags and the precious accent in pink gold-tone metal evokes the “THE EYE” jewellery collection. 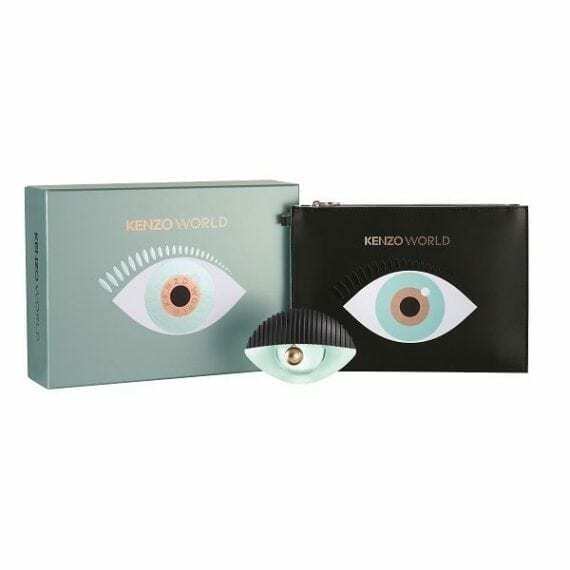 This pretty gift set contains an Eau de Parfum 50ml Spray and Kenzo World Eye Pouch.